Heritage buildings and panoramic water views from Sydney’s northern-most point. The Barrenjoey Lighthouse Walk is a short bush walk with big rewards, amazing views over Palm Beach and whale watching in Winter and early Spring. Barrenjoey Headland is a relatively small peninsula, primed for spectacular views. From the top you can see the vast stretch of Pacific Ocean to the east, Hawkesbury River to the north and the gorgeous still waters of Pittwater and Broken Bay to the west. Time: About 30 minutes up to the lighthouse. Allow same time for return. Track Conditions: Marked track. Some uneven natural stone steps. Grade: The track goes straight up the side of the headland. Steep in sections, some people may find this tough. Water: At the parking area. Public transport: See details below. Coffee: The Boathouse, Palm Beach. 100m from the carpark. Toilets: At the parking area. Swimming: Yes, at Palm Beach. You’ll start on the western, Pittwater side of the peninsula, rather than the Palm Beach side. At the far northern end of Governor Phillip car park, is a signed walking track to Barrenjoey Headland. The track is well-marked. There are two routes to the top, the more genteel Access Trail or the shorter, but steeper, Smugglers Track. Spend some time exploring Barrenjoey Lighthouse and cottages on the headland. You may want to take the Access Trail back down, just to mix things up a bit and make the walk a loop. The Access Trail to the lighthouse is a narrow road, so it lacks a bit of that lovely bush walk feel. Barrenjoey Lighthouse was built in 1881 from sandstone quarried on site. The only way you can peek inside the lighthouse is on a guided tour run by National Parks every Sunday. You’ll also find the grave of Barrenjoey Lighthouse’s first keeper on the headland – George Mulhall. He was struck by lightening four years into the job. Hmm, did we mention don’t walk up to the lighthouse in wild weather? Even though there are a few buildings up on the headland, they don’t include toilets. Or water. Or a fancy cafe. The closest public toilets are at Governor Phillip Park near-ish to the car park. The extraordinary views of Palm Beach to the left, and Broken Bay to the right, is the most photographed viewpoint of the Barrenjoey Lighthouse Walk. There is a rock platform just off to the side, about halfway up Smugglers Track, which is the perfect place for this view. Palm Beach, or “Palmy” is as far north as it can get, and still call itself Sydney. It’s right on the tip of a long peninsula – 45 kilometres (28 miles) north, and a little over an hour drive from the city centre. The phrase “exclusive end of the Northern Beaches” is sometimes bandied about, probably due to the price of local real estate and favoured celebrity holiday spot. But anybody can feel golden sand between their toes, and soak in million dollar views. The track starts (and ends) at the northern end of Governor Phillip Park car park, just past The Boathouse cafe, on Beach Road. Park in Governor Phillip car park (Pittwater Council parking fees apply) or on Barrenjoey Road. Closest Street Address The car park is on Beach Road, Palm Beach. But if you type “Governor Phillip Park, Palm Beach” into Google Maps, you won’t get to the very end of the street where the car park is located. So closest for Google Maps purposes is “The Boathouse, Palm Beach”. The car park is just past this point. Catch the L90 bus from Railway Square, Sydney. It’s a long bus trip – about 1.5 hours. Walking distance from public transport: 2km / 25 minutes. Alight on Beach Road, near Palm Beach Golf Club. Walk along the road north from here keeping the golf club on your left and Governor Phillip Park on your right. Walk for 600m until you pass the golf course and Palm Beach Boathouse on your left, until you reach the car park. The only other way to get to Palm Beach, is as a day trip or tour (best suited for fans of Australian soapie Home and Away, who may recognise Palm Beach as the fictional Summer Bay). 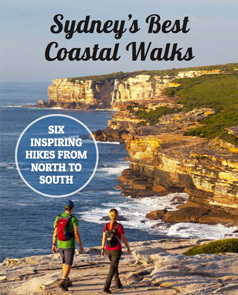 Palm Beach is the northernmost point for Sydney's Great Coastal Walk. Tackle the whole walk over many days, or break it down into sections including the Palm Beach to Manly Walk. Find more of the best whale watching sites in Sydney. These are all land-based vantage points, free to access. Tagged Barrenjoey, Northern Beaches Walks, Palm Beach.